Larger monitor, faster processor: The base device MTS-4000 V2 from VIAVI Solutions has been revamped. 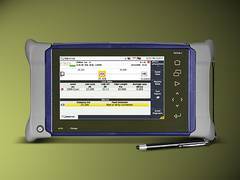 It is operated via a graphical user interface, which is so intuitive that a short training course enables the user to operate the device. The interfaces were also expanded: WiFi and Bluetooth connections have been added to the USB and Ethernet connections of the previous model to ensure fast data transfer in any situation! Remote access is now also possible: Smart Access Anywhere allows technical support to view and help. Via the Cloud service VIAVI StrataSync, complex projects can be controlled and the measurement data sent directly to the head office. Application field. 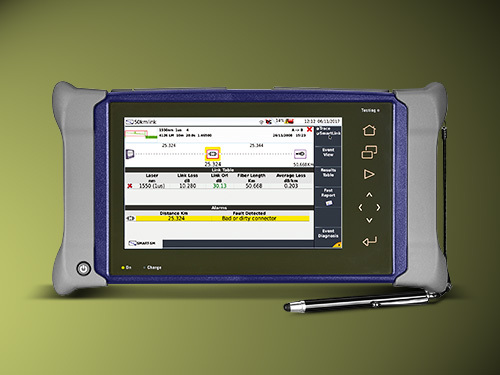 The MTS-4000 V2 is equipped for all network testing situations: From installation to maintenance of access/FTTx networks, the optical fiber connections in mobile networks can also be tested. Connector tests with pass/fail analysis according to the DIN/EN norm are also possible. You simply have to connect the video microscope via USB. Modular assembly. Up to two plug-in modules can be inserted simultaneously into the optical test platform; existing modules of the preceding series MTS-2000/4000 are compatible. A large number of different measuring modules allow measurement in CWDM and DWDM networks (incl. MUX/DEMUX). In addition, multi-fiber connectors (MPO/MTP) can be measured quickly and effectively by means of an optional integrated switch. The new base device is compatible with all modules used with the previous version.